Barry M Instant Nail Effects White & Mint Green | Memorable Days : Beauty Blog - Korean Beauty, European, American Product Reviews. Remember my London Haul? I bought a few Barry M nail polishes while I was there. 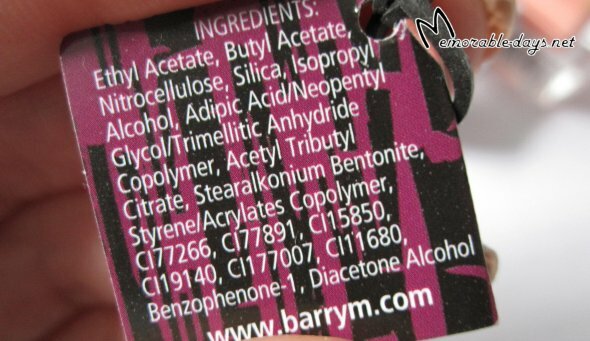 I reviewed two of their nail polishes a while ago, click here for the previous Barry M blogpost. Today I'm going to review two nail polishes of Barry M again. The green one has become my favorite nail polish ♥. It's a crackling nail polish. It dries very fast and it cracks within a second. Also this crackling nail polish has a matte finish. Like I said before, it has become my favorite nail polish ^o^. I'm loving this mint green color, it is perfect for the summer! This nail polish isn't sheer, so a second coat wasn't even needed ^^ it already had a pretty finish after I applied the first coat. It didn't chip that easily compared to the Barry M Peach Melba #318 which is good. Don't forget to shake the nail polishes before you apply it. While you shake it you will see & hear two silver balls in the bottle. These silver balls will mix the color better and faster, so don't remove them! The brush of the mint green nail polish is more thin than the one from the white crackling nail polish. I prefer the brush of the crackling nail polish more because it's easier to apply. However, the mint green nail polish wasn't streaky so I'm happy with the outcome. The instant nail effect white is £3,99 and the Mint green nail polish is £2,99. The retail prices are all the same at the drugstores in London. However, I bought the Mint green for £2.- because there was a buy 2 for £4.- deal back then. These nail polishes are also sold at Topshop, Boots and at their website: http://www.barrym.com. People in The Netherlands can also find these at the webshop, Alice & jo's havesentials. This is the swatch of the Barry M Nail Paint Mint Green #304. Ain't it pretty ^^? I only applied one coat in these pictures. It looks awesome together with the white crackling nail polish ^^! The cracks are looking different on every nail. I applied a thin, medium and thick layer of nail polish on every nail to watch the different effects. As you can see on the picture: the thinner you apply the crackling polish the more cracks you will have and the smaller the cracks will be! I usually apply a top coat after I applied a crackling nail polish but I didn't do it this time, because I wanted to see how long it would last. It stayed for 4 days or so, after the fourth day it started to chip, so always apply a top coat after it! I highly recommend both nail polishes ^^! 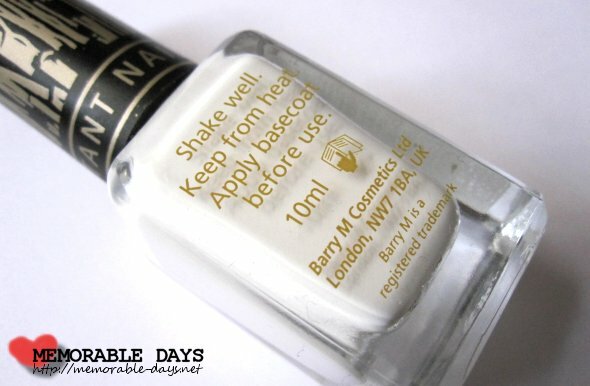 The white crackle nail polish dries extremely fast and it gives you a pretty matte finish. The mint green nail polish is perfect for the summer! The only downside of the mint green polish is the thin brush, but it wasn't streaky, so I'm happy with the outcome of it. I also bought shatter nail polish yesterday but from Opi. ;) LOVE IT. I like the Mint Green nail polish from BarryM It looks so beautiful. But I don't like the white shatter though but very nice review as always. ;) Love your blog! Oh wauw, Mint Green is een heel mooi kleurtje! The minty nailpolish is so cute! Don't like the crackle all that much to be honest. Mint green is erg mooi!